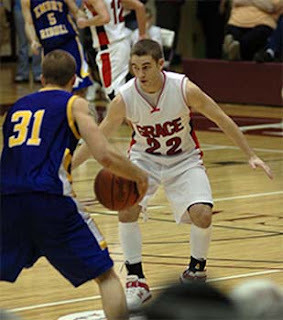 Two Grace Brethren-affiliated schools moved ahead in their respective basketball tournaments yesterday (March 13). The Grace College Lancer men’s basketball team advanced to the round of sixteen at the 17th annual NAIA Division II Men’s Basketball National Championships by defeating #14 Embry-Riddle (Fla.), 75-65. (See photo at right.) The tournament is being held this week in Branson, Mo. In Columbus, Ohio, the Worthington Christian Warriors held off Bedford Chanel, a Cleveland area school, 66-58, in the Ohio boys basketball Division IV semifinal tournament game. Worthington Christian is a ministry of the Grace Brethren Church of Columbus. To read more about the game (from the Columbus Dispatch), click here. To read a story about Worthington Christian senior, Bobby Condon, click here. The Lancers return to action Friday night against Morningside College at 5:45 CST. Morningside was ranked #1 in the nation for nearly seven weeks this season. For more information about the upcoming game and photos from last night, click here. On Saturday, Worthington Christian (26-1) goes up against New Knoxville (26-0) in a 2 p.m. EST game at the Value City Arena in The Ohio State University’s Jerome Schottenstein Center.